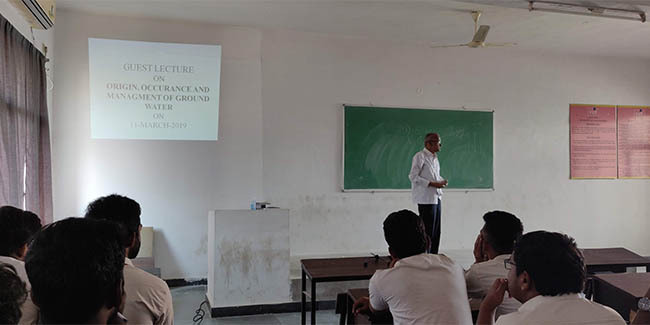 Makkena Anjaneyulu, M.Sc, B.Ed(Rtd) A.D, A.P GWD, spoke about various aspects relating to the origin, occurrence and management of Groundwater. He started the lecture with Hydrological cycle and explained in detail about the various processes involved in it. He explained about the process of infiltration and how the process helps in the formation of groundwater. He explained that the water is distributed in the form of zones vertically below the ground surface and the zone immediately below the ground surface is known as zone of aeration and the zone below to it as zone of saturation. He continued his lecture with the water bearing and yielding properties of rocks. The geological formation which can store and yield water is known as Aquifer, the formation which can only store water but cannot yield is known as Aquiclude, the formation which can’t store but only transmits the water is known as Aquitard and the formation which can neither yield nor store water is termed as Aquifuge. He also spoke about the various methods of artificial recharge carried out to increase the groundwater level. He listed out the methods namely basin method, flooding method, ditch and furrow method, percolation method, recharge well methods etc. He continued that these methods are to be specifically chosen depending on the type of aquifer, formation and soil present in a given area. He explained about the salt- water intrusion and the Ghyben_Herzberg relation used to understand the depth of fresh water below mean sea level and the shape of the interface. He stated that as per the Ghyben-Hezrberg relation, for every one metre of fresh water above the mean sea level, there will be fourty meters of fresh water below the mean sea level. The depth of available fresh water below the mean sea level decreases with excess pumping hence measures like changing the pumping pattern or construction of subsurface structure reduces the intrusion to some extent. He concluded the lecture by suggesting the integrated management of surface water and groundwater. He added that this conjunctive use helps in reducing the water logging effect in areas and improving the groundwater levels in over-pumping areas.